My window overlooks Brookfoot where the Southowram traffic filters into that coming along the valley road from Elland. 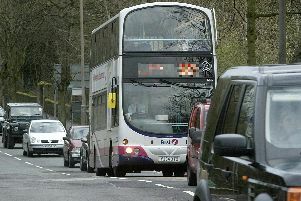 At that very busy time I noticed the build up of traffic moving at a snail’s pace towards Brighouse. Then I noticed a cloud of smoke rising from that location. I thought there must be a fire in the woodland by the mill and expected to see the arrival of the fire brigade; wondering how it could possibly find a route through the traffic jam! The cloud of smoke expanded, rising higher and higher, drifting both up and downstream. I was worried about the woods just below my flat catching fire, there was so much smoke. I finally got tired of watching and by 7pm traffic was moving easily and the smoke was gone. On the Saturday there was exactly the same chain of events, so how to explain all that smoke? Then it dawned on me that the dense cloud of smoke was from exhaust fumes; trapped in the valley bottom with only the up and down stream of air space as an escape route to carry it away. It must be the sheer volume of vehicles that create the smoggy atmosphere. I am thankful that I no longer drive but I enjoy walking into town, avoiding the main road. The elderly have a free bus pass or, if the shopping is too heavy, a free phone call from the supermarket can order a taxi which is reasonable priced. Hurrah, look how much money can be saved if you decide to get rid of the car.